Alex Coolidge ’14 brought home Cornell’s first national wrestling title in 24 years at the NCAA Division III Championships March 15 in Cedar Rapids. Alex Coolidge ’14 capped his impressive career by becoming the Rams’ first NCAA wrestling champion in 24 years. The top-ranked Coolidge claimed a dramatic 6–5 come-from-behind victory over No. 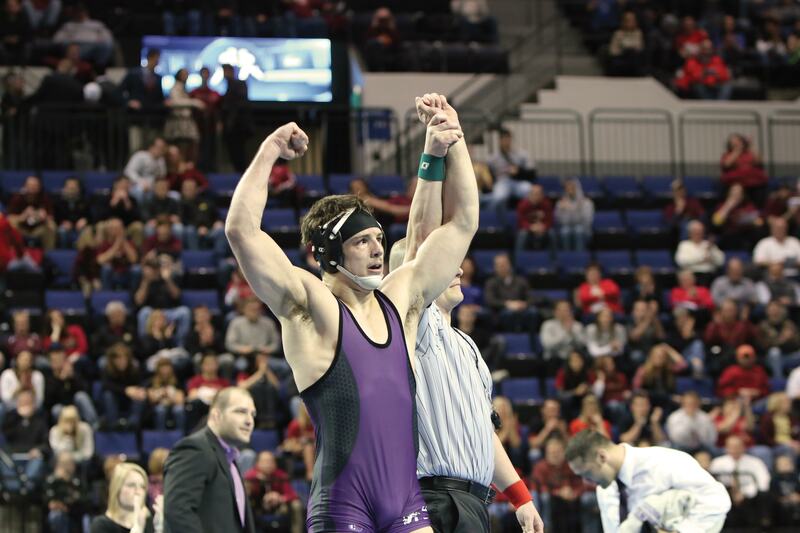 2 Shane Siefert of University of Wisconsin-Whitewater in the 197-pound championship before a vocal Ram fan base in the U.S. Cellular Center. It was sweet redemption for the Rams’ two-time All-American, who finished second a year ago. The Gillette, Wyo., native joined an exclusive group of Cornell wrestling champions in Voigt, Jim Gass ’60 (1963), Walter Romanowski ’51 (1951), Lowell Lange ’50 (1947, 1949-50), Richard Hauser ’50 (1947) and Dale Brand ’38 (1937). Trailing 5–3 with time running down in the third period, Coolidge (29–4) escaped and recorded the winning takedown with less than 30 seconds to go. “A lot of times when you escape, you’re in position to score if you go immediately,” Cornell head coach Mike Duroe said. “Alex has been practicing that all of his life and executed it when he had to. A three-time NCAA qualifier and two-time region champion, Coolidge closed his decorated career 11th on Cornell’s all-time wins list with a 105–32 record. He is the program’s first two-time NCAA finalist in 63 years. Coolidge’s win boosted the Rams to 16th in the final team standings with 23.5 points. It marked the seventh time in the last eight years Cornell finished in the Top 25.